The Dell Latitude 6430u Ultrabook is the first business-focused Ultrabook Dell has produced. While it gets most of the essentials, such as build quality and comfort, spot on, there are a couple of minor issues that prevent it being a perfect debut. This machine is built to rival other premium business machines such as the Lenovo ThinkPad X1 Carbon or the Toshiba Satellite Z930. However, in truth, many business users are finding high-end consumer laptops such as the Samsung Series 9 or MacBook Air are sufficient for their needs. This means the likes of the Dell Latitude 6430u have to offer even more in terms of business-friendly features in order to compete. Dell appears to have taken this into consideration when designing the Latitude 6430u Ultrabook, since there are several interesting features to take note of. The 21mm (0.82-inch) thick chassis has been given a soft, rubberised texture and has been designed to meet rugged MIL-STD-810G military standard test criteria. At 1.7kg (3.7lbs), its not particularly light, but there's no denying it's tough enough to survive being knocked around at the office or when in transit. We can also happily confirm that the solid black design is very easy on the eye - it's reminiscent of Dell's XPS 13 Ultrabook. For the first time in an Ultrabook, there's a removable battery on offer with the Dell Latitude 6430u - something that will be a blessing to business users who travel frequently. The option to switch, or carry a spare, could come in very handy at some point, and you're able to use both 3-cell and 6-cell battery packs with the Dell Latitude 6430u. Like the Lenovo ThinkPad X1 Carbon, Dell's Latitude 6430u offers a second mouse pointer in the form of the nubbin that sits in the middle of the keyboard above the traditional touchpad. A second set of left- and right-click buttons are also included, although we rarely found the need to use these instead of the touchpad. Security is an important part of any business laptop, and the Latitude 6430u offers Dell's Data Protection Encryption service that protects data stored on the machine's 256GB SSD and offers hardware location and disk wipe services in the event of the Ultrabook getting stolen or lost. Of course, all the features in the world can't help a computer if the usability is poor. But in fact this is one of the Dell Latitude 6430u's strongest points. The keys are well-spaced and slightly concave, which makes them very comfortable for extended typing sessions - something you'll be doing a lot of on a business machine. The keys are also backlit, which can prove very helpful if you're typing at night or in a dimly lit environment, such as your average red-eye flight. The 14-inch display is bright and has a matt finish, which means bright lights aren't reflected on the screen. However, this is also where the Dell Latitude 6430u falls down. We're not looking for a stunning display on a business PC, but we do feel that something more than a 1,366 x 768 resolution is required. We'll caveat that by saying it's upgradeable to 1,600 x 900, as our review model was. Lastly, the lack of a touchscreen is a real problem here if you're going for the Windows 8 version of this machine. We'd take a touchscreen over the secondary nubbin pointer any day, and it's a real shame that Dell hasn't included it here - especially when other Ultrabooks are making the feature a standard one. One of Dell's real strengths is the level of customisation it offers with each of its laptops. You tailor the Dell Latitude 6430u to your business requirements when ordering by selecting everything from processor level to RAM to screen resolution. Our review model came with a third generation Intel Core i5-3437U processor clocked at 1.90GHz, and with an impressive 8GB of RAM and a 256GB SSD. This spec has a full price of £1,246 / US$2,026 / AU$2,743 through Dell's online store. As we previously mentioned, it arrived running the 64-bit Windows 8 Pro operating system - although Dell does offer the older Windows 7 Professional OS as an option, which given the aforementioned lack of a touchscreen might be worth consideration. Oddly, the US store doesn't have a Windows 8 option, so it's Windows 7 or nothing there. Business laptops aren't designed as gaming machines or graphical powerhouses, so the lack of a dedicated GPU shouldn't come as a surprise. However, Intel has added some graphical muscle to its integrated HD Graphics 4000 chip, which arrives as part of the package. It may struggle with the latest PC titles, but it should still enable you to comfortably run a few 3D games for when you need a break from work. Dell has opted to use flash storage rather than a traditional hard drive in the Latitude 6430u. This means that although you're limited in terms of space to either 128GB or 256GB, the payoff is a much faster boot-up and quicker run time than when using a lumbering HDD. In many cases Ultrabooks are left wanting when it comes to connectivity, but that's not an issue here. Dell has equipped the Latitude 6430u with several ports that we very rarely see on an Ultrabook. The Ethernet port will give you a hardwired connection to the internet when travelling to a different office, while the HDMI and VGA ports will enable you to use a second display or attach the 6430u to a projector. There's even an eSata port in addition to the three standard USB slots and SD card reader. You'll also find a 3.5mm headphone jack and a Kensington security slot on the side of the chassis. Wireless connectivity is served by 802.11n Wi-Fi and Bluetooth 4.0, as well as the option to include 3G with a dedicated SIM card and data plan. 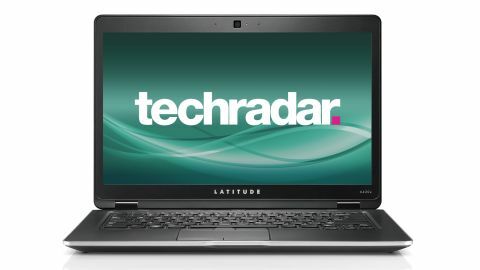 This is an optional extra, but having it further boosts the Dell Latitude 6430u's connectivity range and will be useful for anyone finding themselves out on the road and away from a strong Wi-Fi signal. Ultimately, the specification comes down to your budget and your requirements - you can adjust the order accordingly. We'd always recommend future-proofing your PC by going for the best specification possible, but we also understand that this isn't always affordable for everyone. Either way, the flexibility that Dell offers when making your purchase is to be commended. Given the price of the Dell Latitude 6430u Ultrabook, expectations are high when it comes to performance. Luckily, for the most part there was little by way of disappointment. Given the large amount of RAM in our review model, and the presence of an SSD, the Dell Latitude 6430u predictably ran very quickly. There is a lot of jumping around with Windows 8. No matter how many times we flipped from the desktop to the start menu, quick-scrolled through open applications or ran multiple functions at once, the Dell Latitude 6430u remained constant. It was speedy, without any kind of lagging or juddering. The only time it showed the strain was when we fired up a graphically-heavy gaming test, which is hardly surprising. What also helps is that Dell has kept the Latitude 6430u refreshingly free of bloatware. Instead, you're left to fill the Ultrabook up with apps and programs from the Windows store, which is accessed through the Windows 8 start menu. In fact, any criticism of the performance must be levelled at Microsoft's OS rather than Dell's hardware. It's fair to say that Windows 8 hasn't been able to find its feet quite yet, although hopefully the forthcoming Windows 8.1 upgrade will sort out the most common bugbears. We mentioned before how comfortable the Dell Latitude 6430u is to use, but it's worth reiterating it here. The keyboard at first feels slightly cramped, but quickly gets very comfortable and enables you to type for long periods at speed. The touchpad could be larger, but given the space constraints, it functions very well. It's a capacitive multi-touch surface, enabling you to use two fingers to scroll either vertically or horizontally when inhabiting the Windows 8 start screen. High-stress battery testing ran the Dell Latitude 6430u out of juice in 116 minutes, which is a pretty mediocre score for an Ultrabook. To be fair, in real-world usage, the laptop shouldn't have a problem stretching past the four hour mark. Of course, there's always the option to swap in a spare battery if you suddenly find yourself unable to access a wall socket at the vital time. We have no difficulty in recommending the Dell Latitude 6430u as a worthwhile business laptop. The real question is whether or not it stands as a worthy alternative to a top quality consumer Ultrabook like the Sony Pro Vaio 13 or Acer Aspire S7. Price is certainly an issue - if you want to get the most out of the Dell Latitude 6430u, you'll have to pay extra for the better customisation. The argument to make for this Ultrabook is that the connections and build quality are top class, while usability and performance are equally impressive. The non-tangible benefits Dell offers its business customers, such as the security services and warranty, are also worth bearing in mind. There are drawbacks, such as the lacklustre display and relatively pointless secondary nubbin mouse, but ultimately while they hamper the machine overall, they aren't enough to discount it as a purchasing option. Build quality and comfort are two aspects of computer design that Dell has got right for a long time. The US company has proved that with its Dell XPS range, and continues to prove it here. The tough chassis and comfortable keyboard are very impressive features that serve the Dell Latitude 6430u Ultrabook well both inside the office and out of it. Secondly, the number of connections is unbelievably helpful. If you're touring offices regularly, then you're going to have to deal with older equipment. As such, the presence of a VGA and eSata port is very helpful. This is the same with the Ethernet port, which is mostly sacrificed on Ultrabooks looking to conserve space. If you want a laptop for work, then the usefulness of this extra connectivity should trump the bulk it carries with it. Any Ultrabook shipping with Windows 8 as the operating system but lacking a touchscreen will be hampered when placed alongside most touch-enabled competitors. Microsoft designed the system so that you can reach forward and use the screen to interact with it. That's not the case with the Dell Latitude 6430u, and it suffers as a result. We also have to bring up the alternative nubbin-style mouse configuration. Perhaps it is useful for some people, but for the most part it just appears to get in the way. There doesn't appear to be any need for it here and it doesn't help the aesthetic of the chassis in any way. Similarly, the design and build quality is second-to-none, and anyone looking for a machine to survive long-haul flights and hours of public transport will be impressed. Comfort is a factor too, and we can't fault the Dell Latitude 6430u in that regard. If there is a problem, it's to be found with the lack of a touch-sensitive display and sub-par screen resolution. Other than these issues, there's a great amount of versatility here, helped with Dell's customisable specification options when assembling your order. One word of caution though: expect to spend a hefty amount of change to get what we'd call a decent level of performance.